Yep, it's that time......this Friday is our first FNSI for 2017...and I can't wait! I've got a few things lined up to get started for my night.....the first is something I can slow stitch in front of the tv, whilst I catch up with some Friday Night TV watching. It's the first block of Val Laird's free BOM "Hand-Picked Wardrobe". It's adorable...and you can sew along too. Pop on over HERE and find out more about it. Then I might continue with some more of my cross stitch find. I have made some more progress with the addition of the centre bird but it's slow going. I know a lot of you are prettying up your blogs for the new year and I'd be honoured if you added my FNSI button to your sidebar so that we can have more and more people joining in on all the fun in 2017. Just right click on it and Save Image as or Copy Image over to your site with a link back to my blog. OMGosh - already??? I'll be there! I hope to make a start on a new tote bag. I'm in Wendy but not sure what I will be working on.. This really looks cute! 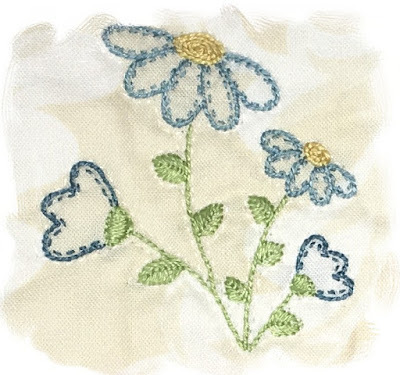 I just might embroider along. 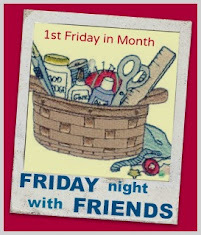 I'm looking forward to FNSI this month! I've got a new project I'm excited about - Triangle Gatherings from Primitive Gatherings - and several other things in the works that will keep me busy all weekend! Always look forward to FNSI night! I plan on sewing a couple more faux chenille kitty blankets while watching the Australian Open! I'm looking forward to Friday Night Sew In for 2017! I have a new grandbaby due in May so this will be a great help! I look forward to sew along with all of you tonight. Looking forward to this coming year and stitching throughout the year with everyone. Thank you for hosting again this year! I haven’t been able to join in one of these for years. What fun! I have some secret sewing to finish up. . but there are other sewing projects that I can show so I will see you later. Have a couple of errands to run & then I'm spending time with the sewing machine and iron! Perfect for a snowy night. I'm so glad tonight is the night. Now, to decide which project to work on! I managed three epp stars and cut and prepared a fourth one. Now I will look what the others were busy with.